As the tales of nearly every entrepreneur and enthusiast illustrate, it’s not hard to become fascinated with bitcoin and digital currency. Usually, bitcoin believers tell a familiar story about how they discovered cryptocurrency, including the moment of realization that lead them to become entirely engrossed in its untapped potential. Still, while there are those who seek to capitalize by building and innovating in the bitcoin ecosystem, others aim to use their understanding to benefit financially from what remains an emerging market. For many, bitcoin’s price is inseparable from bitcoin the technology. According to CoinDesk’s State of Bitcoin Q2 report, bitcoin’s price is a popular subject. For example, four of the top 10 most-read CoinDesk stories in the second quarter of 2014 related to bitcoin’s price. The popularity of stories on price suggests that many bitcoin enthusiasts are seeking to better understand the market as investors. But, in order to do that, they need tools that go beyond the headlines to indicate the underlying health of the market. Coinalytics began in Germany, where Federici, a Switzerland native, participated in Startup Weekend, Berlin. That event encourages participants to try new things. During the early stages of the competition Federici and his two teammates realized that bitcoin was interesting, but the timing wasn’t right for a project aimed at the masses. 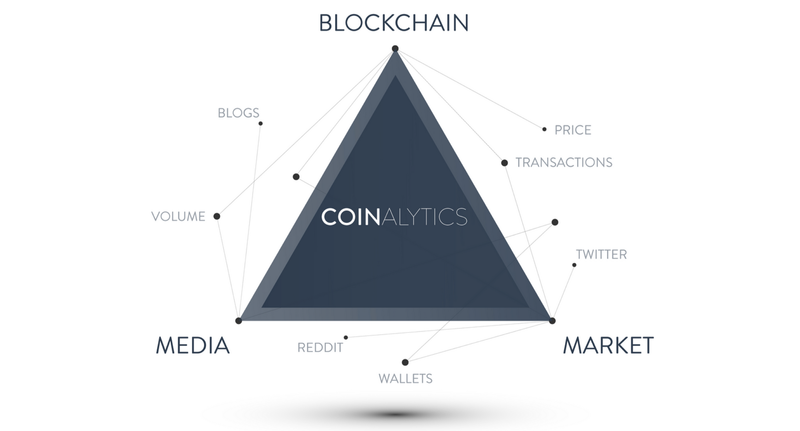 The early Coinalytics idea was to take a number of data sources that were freely available and make them more useful for analysis and application. The Startup Weekend team built a mock-up and a running prototype within 48 hours that collected data and displayed price. Their approach and final result netted the project an award for “Most Innovative Idea” at the competition. Inspired by his success in Berlin, Federici decided to forgo his MBA studies in Europe to head to Silicon Valley. While attending various bitcoin meetups in the area, he met 500 Startups’ partner Sean Percival. At the time, Percival had recently announced 500 Startups’ next batch would include bitcoin startups, and that he would be mentoring them. Coinalytics was eventually accepted into 500 Startups’ Batch 9, which included five bitcoin companies in total. 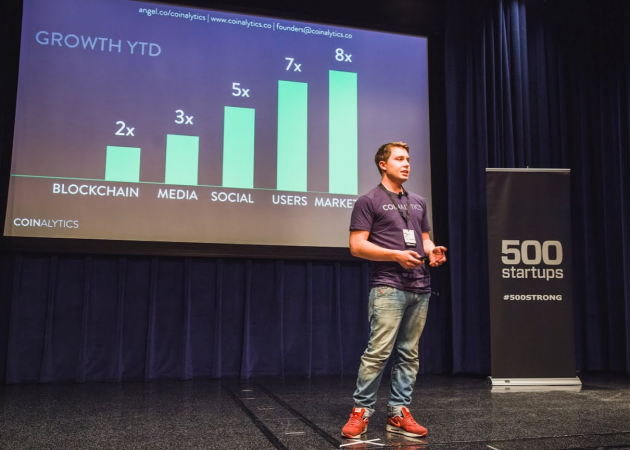 By 500 Startups Demo Day in July, Coinalytics had developed a dashboard as well as infrastructure to let users add new types of data to its platform. Coinalytics CEO Fabio Federici pitching his company to investors at 500 Startups Demo Day. The company is currently using information culled from the block chain, prices from many exchanges and sentiment from social media, among various sources of data. Coinalytics also brought on two other founders during 500 Startups – Bill Gleim; a former software engineer at Google, and James Edwards; previously a data architect for Amazon Web Services – to peer deeper into bitcoin’s data structures. “The next step is going to be doing deeper analytics on the block chain itself – where we see a big gap right now,” said Federici. He added that Coinalytics is going to focus on building what the company calls ‘entities’ in order to show connections between addresses on the block chain. 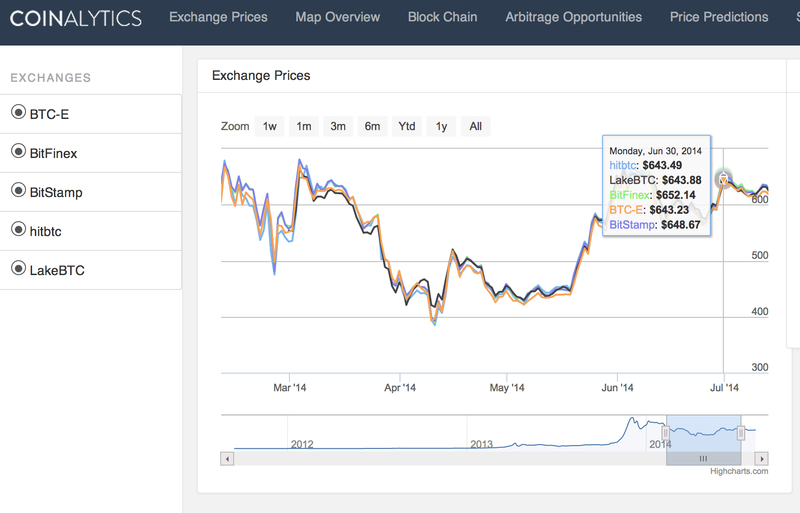 This will show users how bitcoin flows through the system, a different view than that of the block chain. “[It] won’t show every transaction, but [it will] at least show connections, how the bitcoin flows between entities,” said Federici. Still, data collection for bitcoin-related metrics back in November 2013 might have seemed novel at the time. But now, there are now several other startups trying to become the source for bitcoin analytics – and many existing financial services businesses that could be interested as well. However, Coinalytics thinks its solution will continue to offer a unique perspective into the world’s most popular cryptocurrency. 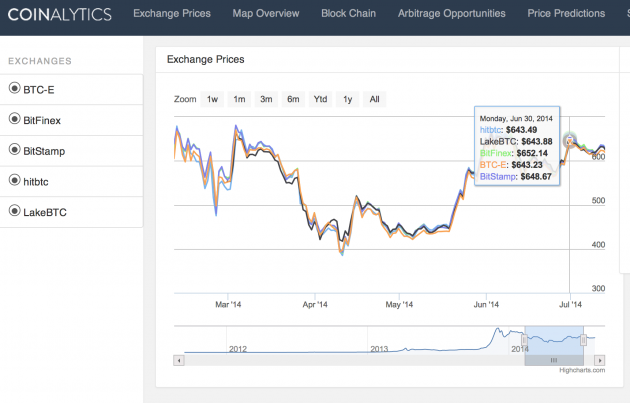 Federici likes to tell people that Coinalytics is “the Bloomberg for bitcoin”. Bloomberg has been very successful selling data for financial markets, and the news and information giant could eventually be competition for Coinalytics should it ever get into the digital currency business. In fact, it is already showing bitcoin prices on its well-known Bloomberg terminals. Federici said he’s not concerned about a possible rivalry, however. Rather, the phrase is just a way to easily explain what Coinalytics does, since bitcoin is still new to many in the financial world. While Coinalytics has competition from startups like TradeBlock, which recently raised $2.8m from Andreesen Horowitz, Barry Silbert and others, Federici says there is space for many companies to help answer data-based questions about bitcoin. “There will be ways to figure out a niche,” he said. The startup plans to reamain in the Bay Area now that its 500 Startups session is over. Coinalytics has found interest, for example, from other bitcoin companies in the region that don’t have the time to collect and analyze bitcoin-related datasets. Coinaltyics hasn’t announced any big companies as customers yet. 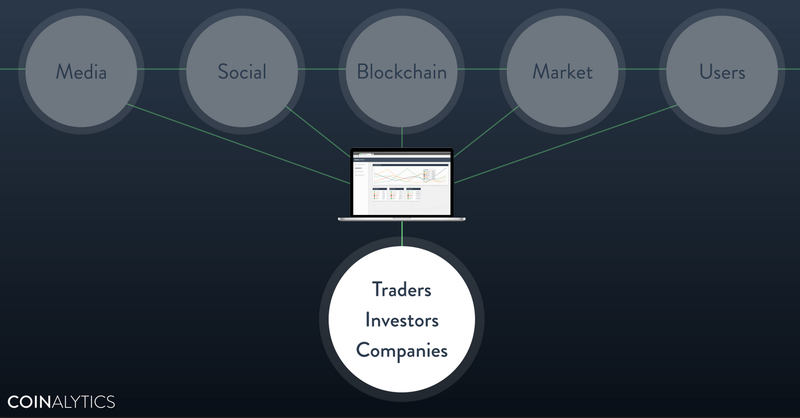 But, the startup seems confident it can provide insight for traders, venture capitalists and bitcoin entrepreneurs trying to profit and create products within the industry. Coinalytics is currently in private beta. Early access signup to the platform is available on its website.